DAME OKOWA CUDDLES, PRAYS FOR FIRST BABY 2018, PURITY BRIGHT; GAVE GIFTS. By Fred Latimore Oghenesivbe Esq. 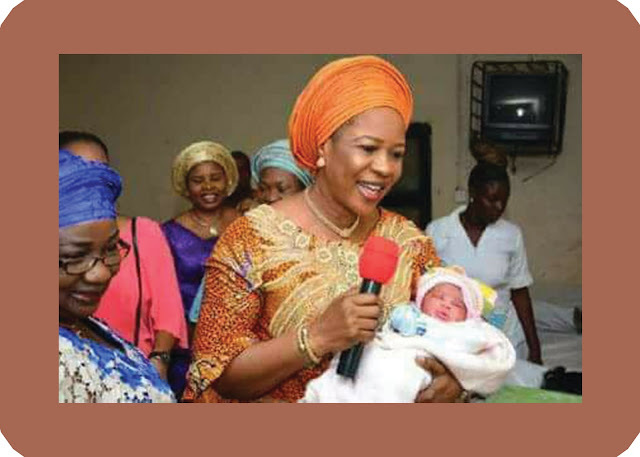 Typical of Delta State First Lady and great Lover of Children, Dame Edith Okowa was on hand at the Central Hospital Agbor to rejoice with Delta State baby of year 2018, PURITY BRIGHT. The child was born at 12:37am on Monday January 1, 2018. It is the age-long practice that the first baby of the year must be sort after by the First Lady. DAME Okowa is a superb grandmother, a unique Evangelist and a prayer warrior. She love to pray in and out of season and that was exactly what she did when she cuddled baby Purity. She took a step further to also shower material blessings on the baby, prayed and rejoiced with others in the hospital at the time. Delta First Lady and founder of 05 Initiatives has done so much since His Excellency Senator Dr Ifeanyi Arthur Okowa took oath of office in 2015. Her pet project; the Sickle Cell centres at various General Hospitals across the three Senatorial districts attests to her passion for helping society improve the health conditions of our people particularly Deltans. The 05 Initiatives projects comes with free drugs and other assistance for sufferers of the dreaded sickle cell ailment which today has been successfully managed in the state. It is the sincere desire of Dame Okowa to put simile on the faces of those afflicted with the ailments, unpleasant conditions of life and her efforts has yielded tremendous results. She enjoined Deltans to pray even more in 2018, adding that the socioeconomic fortunes of the state shall significantly improve for the good of all. The wife of the Secretary to Delta State Government, Mrs Kevwe Agas is the Administrator of the first lady's NGO, THE 05 INITIATIVES. Congratulations to baby Purity Bright. The world is yours, explore it.